A new study by Action Against Hunger and partners indicates that mothers can use a simple armband/tape (MUAC tape) measurement tool to accurately screen their children for acute malnutrition. Mothers are powerful. We have always known it. So we are happy to share some important new findings. For nearly forty years, in our efforts to enable communities to be free from hunger, Action Against Hunger has sought to empower mothers and caregivers to understand the warning signs of acute malnutrition—and make sure they know when and where to take their children for screening and treatment for malnutrition. Over the years, we have trained thousands of frontline community health workers to bring screening services directly to remote, hard-to-reach villages. But there often aren’t enough community health workers to reach every child in need and detect acute malnutrition early, before it becomes severe—an essential key to saving children’s lives. The most common method used to screen for acute malnutrition in communities involves what looks like a simple measuring tape. The mid-upper arm circumference (MUAC) tape is a long, colour-coded strip marked with graduated measurements. If the measurement of the girth of a child’s mid-upper arm is within the yellow part of the band, it indicates that the child is suffering from moderate acute malnutrition. If the measurement falls within the red part of the band, it indicates that the child is suffering from life threatening, severe acute malnutrition. Precision in measurement matters: an error of even just a few millimetres can mean the difference between an accurate diagnosis and an inaccurate one. That’s why the use of MUAC tape to detect undernutrition has traditionally been entrusted to trained, experienced community health workers, community health volunteers, nurses, doctors, and formal health workers. But years of success in training community health workers to accurately detect undernutrition with MUAC tape made nutrition scientists curious. 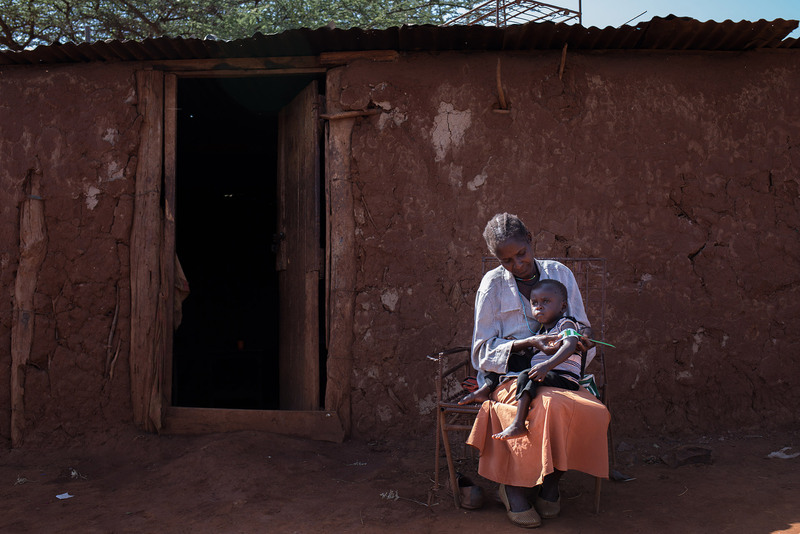 Could mothers and other caregivers be trained to screen children for undernutrition using the MUAC tape? Trained local Community Health Volunteers work across Kenya in partnership with the Ministry of Health to provide basic health education and services to families who may not otherwise have access. In Kenya, these volunteers are selected by their neighbours and serve their own communities. Judith Muthoni Ndegwa has been a Community Health Volunteer for seven years, and she covers 30 to 40 households. She regularly talks to mother-to-mother support groups organized and facilitated by Action Against Hunger about nutrition and the importance of breastfeeding infants. She also helps Action Against Hunger train mothers to detect undernutrition using MUAC tape.